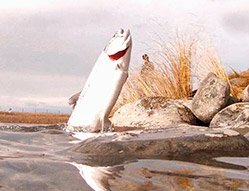 E-book on how to fish the hydro canals around the South Canterbury town of Twizel with tackle, techniques and map. ISBN 978-0-9582933-7-2. Published by Allan Burgess 2013. All colour 71 pages. Available by instant download (see below). 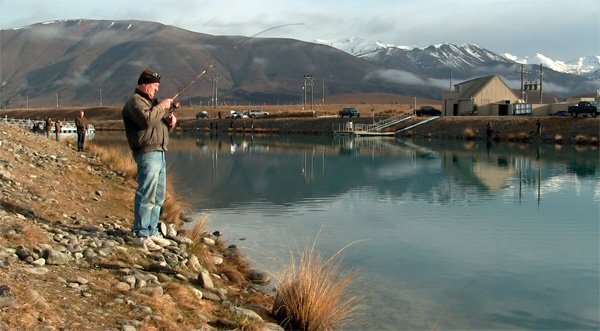 The hydro canals of the Upper Waitaki Power Development Scheme, centred around the South Canterbury town of Twizel, offer some of the best freshwater fishing to be found anywhere in New Zealand. The big well-conditioned trout and salmon in these man-made canals represent an interesting and challenging target for novice and experienced anglers alike. For the beginner, fishing the canals, there is a much greater chance of catching a fish than would otherwise be the case in a normal river or stream. For the more experienced fisherman or woman, there exists a golden opportunity to try out different techniques and tackle than one might otherwise use. At times there are so many fish present that it is almost impossible not to hook one on every cast. At other times you can be forgiven for thinking that all the fish have gone from the canal entirely! In the Ohau and Pukaki Canals, the catch is overwhelmingly Quinnat salmon. Although salmon are liberated into the canals by Fish and Game they also contain salmon that have escaped the farming pens for one reason or another. The e-book is in .pdf format and will load and play in high resolution on your smartphone and tablet, as well as your laptop and desktop computer. There are many giant brown and rainbow trout present together with the salmon. I’m talking 37-pound rainbows, 45-pound browns and “double figure” salmon. Fish farming is the main reason the fishing here is so good at the moment. The salmon are fed by workers tossing scoops of feed pellets across the surface water of the pens. Not all of the pellets are eaten by the inhabitants of the pens as they descend. It appears a fair percentage of pellets pass right through the bottom of the nets only to be snapped up by wild fish. This can’t be good if you are paying big money for feed only to have some of it sink out the bottom of the pens! One of the main reasons the pellets are feed out by hand is to minimise wastage. Sometimes the farmed salmon are hungry and other times not. It is the job of the person feeding out to determine the mood of the fish and feed out accordingly. Nevertheless, most of the “wild” salmon caught by anglers either contain pellets or have a condition factor so high that they obviously have been recent. The salmon caught by anglers in the canals where there are fish farms are short and stocky, and always give a good account of themselves when hooked. Salmon from the Twizel canals. Fishing Ohau A near the fish farm. Please note – you are buying an ebook which enables you to gain instant access to the information without having to wait for delivery or pay shipping and handling costs – we do not ship a physical book, you can easily print the book out on your own printer at your convenience. Fishing the Twizel Canals by Allan Burgess comes as a high-resolution pdf file with 84 colour pictures. The pdf is just over 16mb in size. We’re so confident you’re going to love “Fishing the Twizel Canals by Allan Burgess,” we offer our ironclad, 100%, you-can’t-lose money back guarantee. 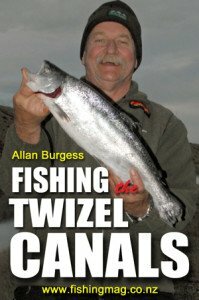 Order “Fishing the Twizel Canals by Allan Burgess” right now, read it cover to cover, if you aren’t completely satisfied, then we don’t want your money. Simply contact us anytime within 30 days and we’ll refund all of your money! What could be fairer than that? P.S. Remember, the risk is entirely on me. Read “Fishing the Twizel Canals by Allan Burgess ” for 30 days and if you aren’t satisfied, for any reason, just ask for a prompt, full refund. Was NZ$19.95, Now available as a free bonus download when you purchase The Complete Guide to Fishing the Twizel Canals by Allan Burgess (2018).